During a recent trip to Wegman’s, I assembled a mixed six with a predominantly English and German slant. The first bottle I pulled out of the six was the Fuller’s London Pride. Now, we had a lengthy discussion regarding aging when I came across a 2010 Fuller’s Vintage Ale and with the help of Miracle Max, we put that theory to the test with 2009 through 2011 bottles. Additionally, awhile back I had the London Porter and the Gale’s Prize Old Ale. So, the folks at Fuller Smith & Turner are not an unknown. The London Pride is an English Pale Ale and the UK’s leading premium cask ale. 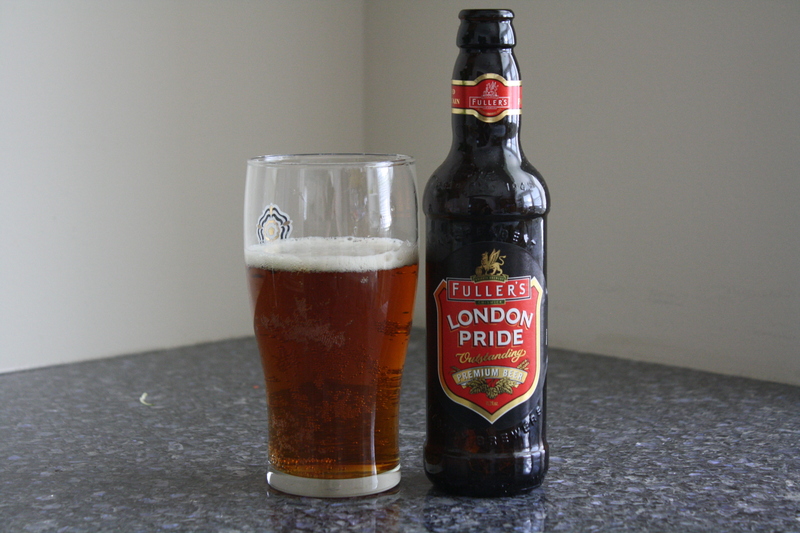 Fuller’s is known for the London Pride as well as a number of other award-winning ales such as Chiswick Bitter, ESB and 1845. Fuller’s is the only brewer to have had three of their beers (London Pride, ESB and Chiswick Bitter) named Champion Beer of Britain. Known and loved for its distinctive, rounded flavour, London Pride is the award-winning beer for which Fuller’s is most famous. In recent years its popularity has grown to the extent that it is now Britain’s leading premium ale: a welcome fixture in many pubs and off licences around the country, and now winning new friends abroad. To the beer afficiando looking for the classic English pint, we say this: Whatever you do, take Pride. Appearance: A light amber with light foam and good lacing. Aroma: Sweet malt, a bit doughy with a hint of caramel and hops. Taste: Just like it smells; a well-balanced blend of flavors with a slightly bitter finish. As I do with all of the beers, I passed the glass over to my better half. Her response, “this is actually good” should be considered high praise for this beer. I think the London Pride is every bit as good as advertised. In Search of Beer Answers This Question: Why Philly Beer Week? When is someobody going to deal with these English people and their “U” swiping proclivities! I can’t even count the times that I’ve had to call over to my neighbors at odd hours to ask for a spare ‘u’ or two in order for me to complete a finely crafted sentence. Meanwhile, these bloats with their silly accents and coconut clapping fake horse riding habits see fit to stuff extra ‘u’s into words with little regard for the rest of us or for the detrimental effects that practice has upon the more sensitive regions of our fragile ecosphere. Time to oil the siege engines and gift them with a Trojan Tick!!! But they do know how to turn out a nicely balanced traditional English Pale. After all, they do have the accent to do it correctly. What is this sentence doing here? Bit of an off colour statement there is it not? I mean it may not be flavour of the month to honour the old style of spelling, but if you will humour me I will try my best to explain. I had heard a rumour from my neighbour that the Americans labour under the misapprehension that we are adding a u. We invented the sodding language, therefore you are dropping a u, littering the planet with your carelessly discarded waste. Care for nature. Use your u’s correctly. Ah! * commencing the Graham Chapman accent* It’s about time somebody over there cleared the hovercraft of eels and and made their way to the internet pub for a spot of tea, scones and an adjective-laced sentence or two. Not one to back away from an argument, I shall gladly engage in a modest effort of re-education and clarification regarding your continued abuse of the letter ‘u’ and misguided application of the “English” language in general, which I shall grant you have had some hand in creating; however, if left to your own devices, would not have allowed advances in diction, phraseology or creative wordsmithing which has become the stock in trade of such literary luminaries as The Lady Gaga, President George W Bush (whom I know you are particularly fond of over there), and Beavis. The King’s English, such as it was, remind me of the days when cutting medicine was little more than forcing a gentleman to endure days on end of restraints and leeches. “don’t worry, good ‘ole boy, those leeches will have you fixed up right in a jiff!” As has oft been the case in the history of our peoples, we have improved upon your hobbies (save for Jaguar, perhaps, we should never have messed with them – certain perfection needs no improvement). And Genesis (Gabriel era, that is – the Phil Collins years did have a bit of an American cheapening element to then…). Hmmm… Fish & Chips. We really haven’t gotten that down yet either. Only truly great plate of those is at Ye Olde King’s Head in Santa Monica, CA. Founded, owned and operated 100% by British ex-pats. OK – so there are a few things that we probably need to stay away from…..
That said, while our American founders focused publicly on certain other offenses of the Realm in support of the cause for independence, it has been long known in literary circles that abuses of the ‘u’ were central to their concerns. Our country is founded upon the unabiding principle of freedom and nowhere is that more evident than in the cause for freedom of the ‘u’. It deserves a voice free of being forced to co-habitate in close proximity to the letter ‘o’. We both know that ‘o’s don’t necessarily mind their hygiene and their buttocks are often possessed of offensive issue. I shall now leave you to ponder a response while I partake of an English Muffin and Tetley’s. I’d offer to tip a pint in your direction; however, our peoples have also advanced the concept and practice of time. We recognize the sublime value of the morning sun which is why we are still enjoying it over here. I must say good sir you have hit the nail right on the head with us Limeys love of George W Bush. The biting satire he brought with his depiction of the bumbling of those in power put the equivalent British depictions of government such as “Yes, Minister” and “The Thick Of It” to shame with its effortless skewering of the expectations of the halls of power. Such is the popularity of his comedy here that few of us could tell you who was actually the President of the USA for the eight years that his sketch show was on the air. I must feel though your representation of the history of the ‘o’ and ‘u’ to be a tad one sided, for while the freedom gained by the ‘u’ is to be commended, was it not based on exported cultural depictions of the ‘o’ that are considered shamefully caricature like in these more enlightened times. In fact the problem these days is not the fact that a ‘o’ and ‘u’ can be considered separate, but the ‘u’ now lacks the freedom to be with an ‘o’ if it so wishes of it’s own free will. A fact your president recently acknowledge when he quite rightly came out in support of ‘o’ and ‘u’ marriages. Here in the UK we quite often see the o away from the u, in such groups as “gone” and “”mum”, but still acknowledge that the two can be brought together. For some reason, I have yet to start exploring overseas breweries in my beer journey. Great post, I might just have to pick one of these up next time!